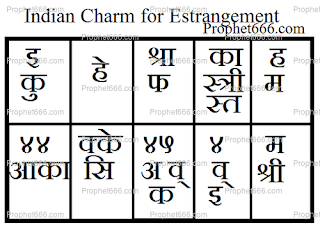 This is a Hindu Charm, which works in a manner that is similar to the working of a Yantra in casting a Voodoo Spell to facilitate the estrangement of two people. This working is similar to that of the special Yantras for this specific purpose, which are called as Manmutav Karne Ke or Badhane Ke Yantra, Upay or Totke. 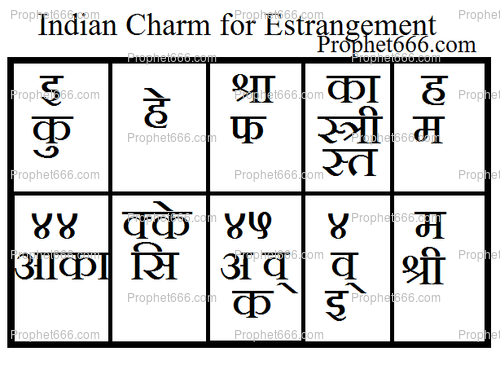 This charm uses a very simple procedure, which is described in this post to break up the relationship, love affair or friendship between two persons. The Yantra shown in the image should be drawn on both the sides of a Wood-Cutting Saw. The practitioner can use any kind of ink or pen to draw the Yantra on the Saw. Once the Yantra has been drawn on the Saw, it should be nicely heated on a flame. This is the only procedure prescribed in the Tantra for practicing this Yantra Experiment. Notes- I do subscribe to the use of this or similar kinds of Voodoo Spells and they should be utilized only if the situation is uncontrollable and you are helpless and left with no other option and if someone is going all out to harm and destroy or your family and loved ones. This is a onetime Yantra Experiment and the success or failure of these Occult Spells largely depends upon the intensity with which the practitioner practices them. The Yantra Experiment can also be termed to be kind of Videshan Yantra Experiment. The saw can be washed and used like before. Where should be wrote name of two persons? Neelji, where do I have to write the names of two people? To all the queries above, there is no need to write the names of the two persons sought to be separated because you already know who you are trying to separate.